"Would you rather be praised or punished?" Praised? That’s what I thought. We all love to hear praises and receive awards for a job well done. Well it's no different with your Miniature Schnauzer. This is the whole theory behind using positive reinforcement techniques when training your dog. It's what I call Tricks for Treats and it simply means to reinforce good behavior with food treats, verbal praises, a favorite toy or game... or whatever it is that your Miniature Schnauzer sees as a reward. You get what you want - the behavior - and in return, your dog gets what he wants - the reward. You begin shaping and training your dog's behavior the minute you bring him home. You may not realize it, but how you react to everything he does is shaping and reinforcing what his future actions and behaviors will be. The best way to ensure you will end up with a happy well-balanced dog is through behavior training. You need to teach your Miniature Schnauzer what behaviors are acceptable and those which are not. This is how you prevent bad habits from forming in the first place. And there's good news: Since Miniature Schnauzers are extremely smart and love to please their owners, training them is actually fun! And training your Schnauzer will further strengthen the bond between the two of you. Another win-win! dog training tip: A word of caution about Miniature Schnauzers; Because they are so smart, we sometimes expect too much out of them. Be patient and give your Schnauzer time to master each new command, trick, or desired behavior. Dogs learn through experience and their behavior is shaped by its consequences. This one statement alone will help you with all of your dog training. Another way of explaining this is: Dogs behave in ways that will produce a postive consequence or reward and avoid behaviors that produce negative consequences or no rewards. When a dog learns that a certain behavior realizes him a reward, the frequency of repeating that behavior increases. And if the behavior produces a negative outcome, he will stop the behavior all together. It's just that simple. So now that we know how dogs learn, its time for you to figure out what motivates your Schnauzer. What does your dog like or deem as a reward? Since most dogs respond favorably to food, dog treats are the most used and easiest rewards to work with. But you should also use and incorporate verbal and physical praises like "Good Boy!" and petting your dog. Offering up different rewards will prevent your Schnauzer from becoming dependent on food rewards only for appropriate behavior. If your dog is not motivated by food, perhaps a favorite toy will work during dog behavior training sessions. Positive reinforcement training is both an effective and humane way to train your Miniature Schnauzer. So keep nearby a handful of treats or kibble and make sure you reward your dog right away for proper behavior. dog behavior training tip: Never give your Miniature Schnauzer a treat without him first performing a trick or command. Even if you just have your dog SIT before receiving his dog treat as training should be reinforced throughout your dog's life. 1. Do not introduce too many tricks to your Mini Schnauzer at once. Allow your Miniature Schnauzer to master one trick before teaching him another dog trick or dog command. 2. For successful dog behavior training sessions, keep the training periods down to 10-15 minute intervals several times throughout the day. Structured training 3 to 5 times a day works best. 3. For simple dog tricks, learning 2 a day is possible for your Miniature Schnauzer. For harder dog tricks, only teach one a day but integrate an already learned behavior into the process as well. Another form of positive reinforcement training is called clicker training for dogs. Timing is a key component you'll need to master in order to successfully train your Miniature Schnauzer with this method as the Click=Reward (see dog training tips). You start by rewarding your Miniature Schnauzer for just responding to the sound of the clicker only. It is important not to talk to your Schnauzer when practicing this method of dog training, at first. First, we will teach our Miniature Schnauzers the basic dog commands. 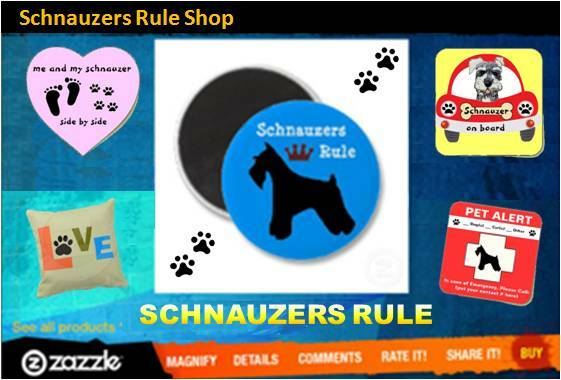 Teaching your Schnauzer the basic dog commands will also teach him words and signals. Communicating this way with your dog on a daily basis will improve his overall ability to quickly master new tricks, later on. So before beginning any of the cool dog tricks shape your Schnauzer's behavior with useful good manners and obedience commands.